The Brit and I found ourselves at loose ends on a Sunday afternoon. I wasn’t excited about getting up and cooking as I had hurt my foot in San Francisco on Friday. That left us one option: go out and look for a new place to eat. 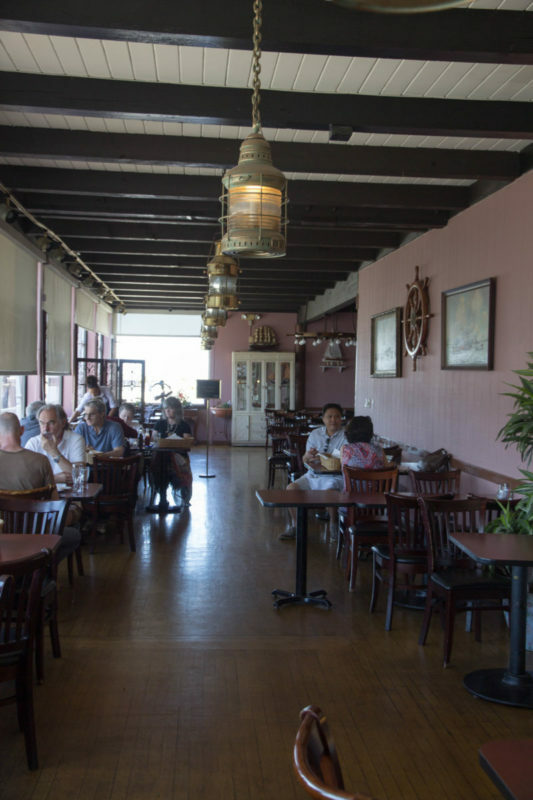 The Brit takes the ferry every weekday from Vallejo Ferry Terminal to San Francisco’s Ferry Building. 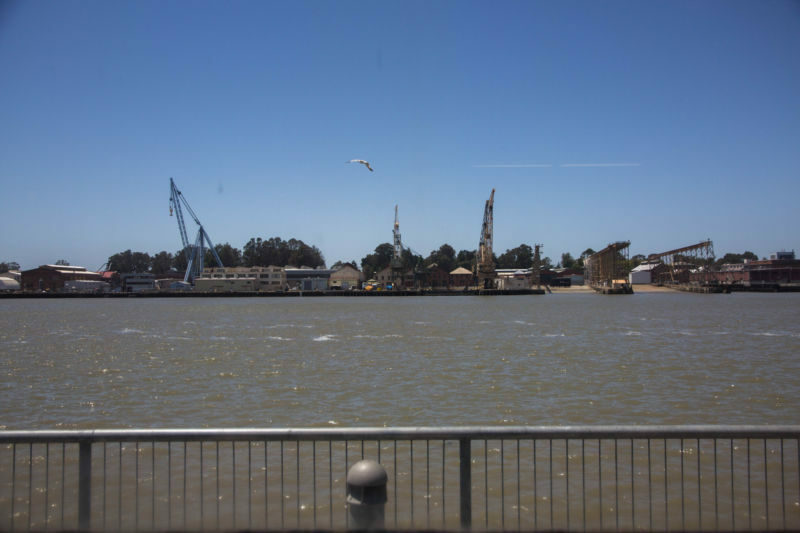 There is a trio of restaurants on the Vallejo Waterfront, and as it was a nice day, he thought it would be a good idea to go and try one out. Vallejo isn’t the most salubrious of places. There are parts of it I wouldn’t even like to drive through in daylight, but the Ferry Terminal is very nice, and the places in it look well kept. 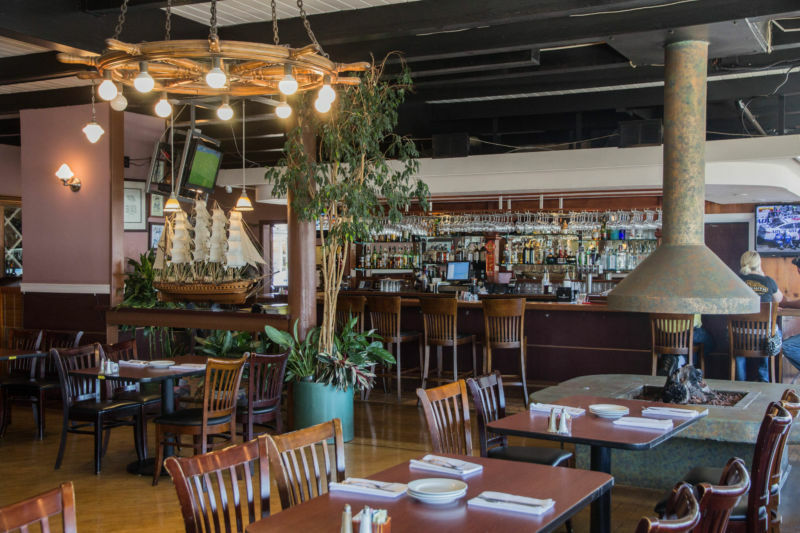 After studying the menus of the three places, we decided on the Front Room at the Wharf. We had eaten there years ago with my mother, but I didn’t remember it nor its food. 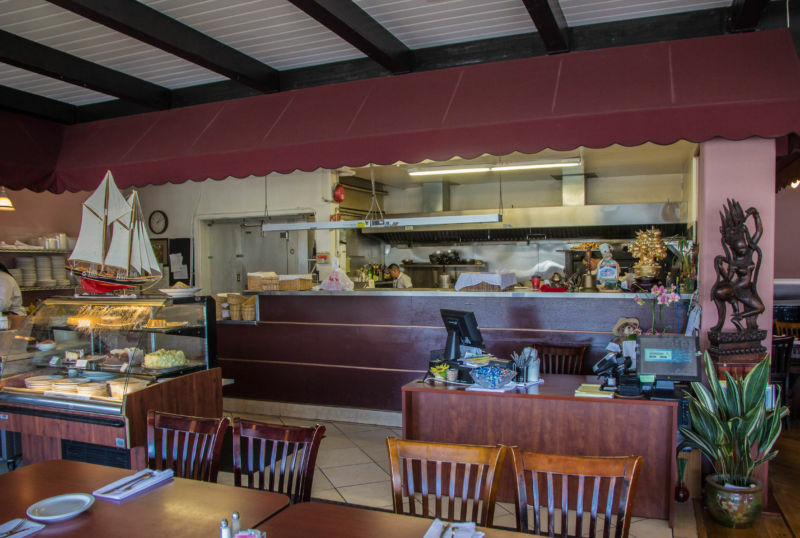 The menu is a combination of fish, Italian, burgers, salads, and sandwiches. 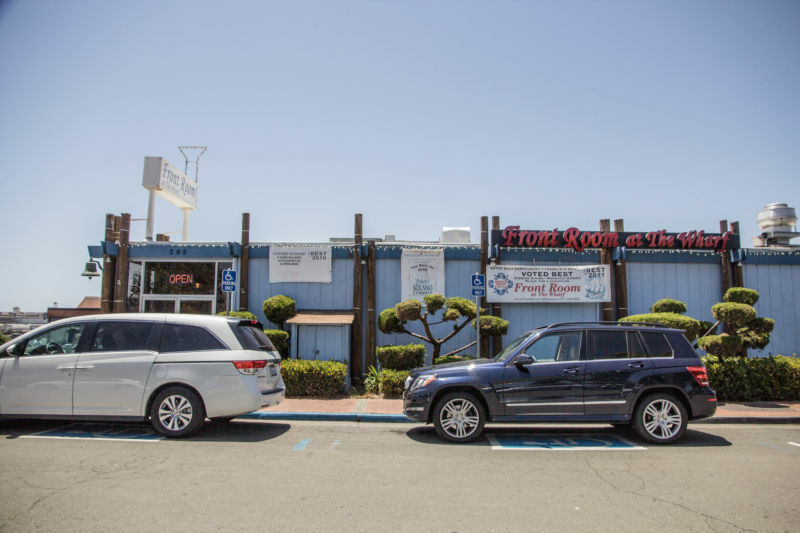 It describes itself as a casual American eatery with water views. When looking at the menu again, I was a bit concerned. The dishes were on the expensive side for a restaurant that looked like this. For example, the crab cake appetizer was $16. The entrées were between $16 and $30. However, in contrast, the burgers and sandwiches were only $10 – $14. The pizza ranged from $10 – $25. They do have a full bar there, but don’t expect good wine; it was very basic stuff. We both opted for iced tea. The Brit comments: We had yet to eat and had plans to visit a vineyard after lunch, so abstaining for this meal was the sensible choice; a decision made easier by the unappealing wine options. Our waitress was very good. She was attentive and efficient. She refilled drinks and was very knowledgeable about their menu. I liked her personality. The one service let down were the dirty ketchup and mustard bottles. They were so bad I felt the need to clean them with a wet wipe I had in my handbag before allowing The Brit to touch them. (He would surely have made a mess all over himself.) After that small infraction, everything got far better. After agonizing over the menu choices, The Brit and I decided to share dishes. I ordered the pepperoni and mushroom pizza to which I added onions (The Brit doesn’t like pepperoni so we ordered his half without). He ordered the French burger medium rare with American cheese. 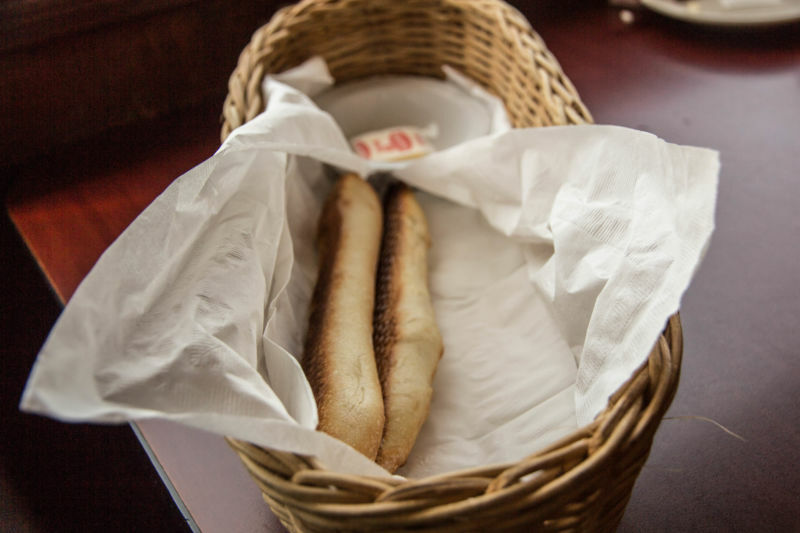 While we were waiting, our waitress appeared with a huge basket of warm, soft, bread sticks. They were delicious. The only thing missing was a bowl of marinara sauce, or some balsamic vinegar and olive oil to dip them in. The pats of butter they served with the bread were only standard cheap fair. I would much rather have some salted European-style butter or one of the other alternatives. It didn’t stop me eating a couple of sticks. It was a good start to the meal. When our food arrived we were both impressed and relieved. My pizza looked absolutely beautiful. Was it gourmet? Well, no, but it reminded me of the great pizza I had in neighborhood Italian restaurants as a kid. 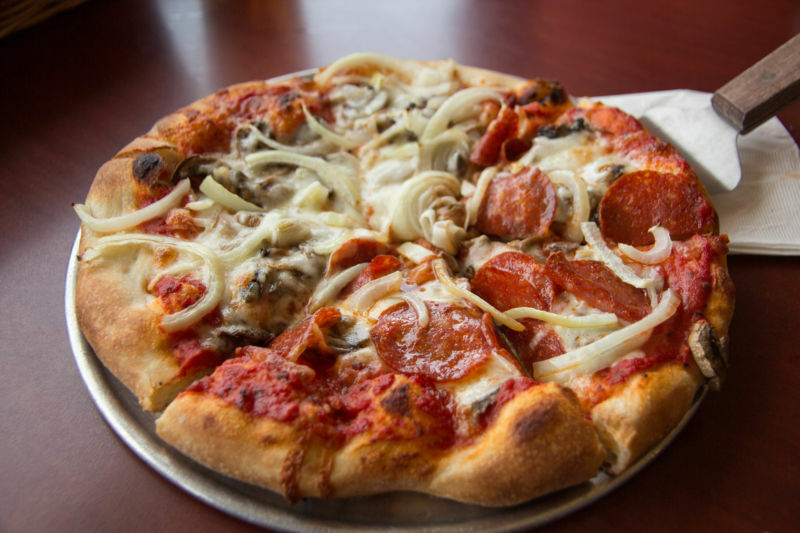 Great flavor, beautiful crust, and nice toppings. For our taste, it was a little shy on the sauce (the sauce on it had great flavor), so next time I would order it with extra sauce. They described their crust as being thin. I would disagree and call it a medium thickness. The flavor and cook of the crust were great. I really enjoyed the pizza and would order it again. The Brit’s burger wasn’t anything I would call gourmet. It was a perfectly cooked burger with American cheese and thousand island dressing on a french bread roll. The fries that were served with it were thick cut fries which are The Brit’s favorite. The lettuce, tomato, onion, and pickles were served on the side. Everything was fresh and perfect and it was just as described on the menu. Another overwhelming win! 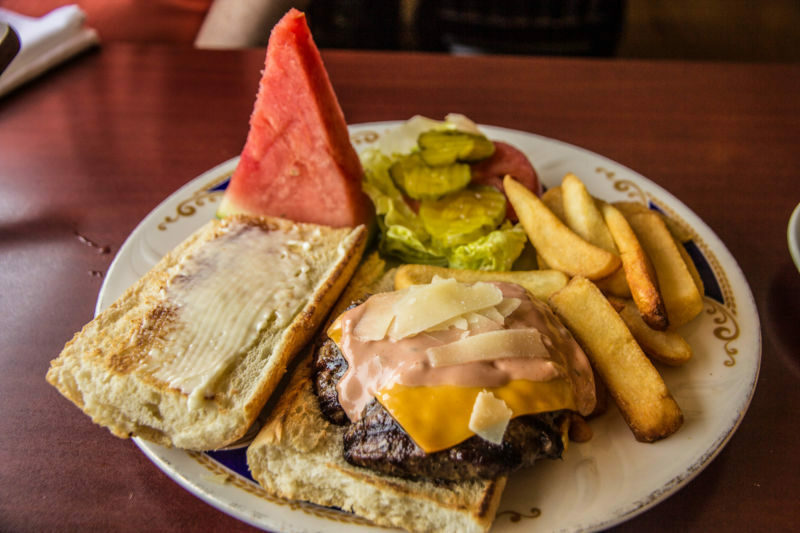 The Brit comments: The menu described the burger as being topped with “secret sauce”, this is a common phrase in the US that is a synonym for “thousand island dressing”; hardly a secret. The French bread in place of the traditional bun was the justification for the burger’s name but was an excellent addition. We did not end up trying the dessert, as we were stuffed with the food we had. They looked really good from what I could see in the refrigerated case. There isn’t an actual dessert menu as the items change all of the time. The waitress simply tells you what they have on offer. Sampling this food, I would be very interested in trying some of their fish and Italian dishes. Maybe I will meet The Brit one night there as he returns home from work. At least I could have him pick up a pizza or other dinner items there and bring them home one night that I don’t feel like cooking. Sounds like a good plan to me! The Brit Comments: Between California Girl writing the article and the addition of my thoughts, she followed through on the plan. We ordered an extra-large pizza from Front Room at the Wharf that was true to its name. It gave us dinner and then lunch next day. The extra sauce that we requested lifted the pizza. Bonus points to the restaurant for providing containers with parmesan and chili flakes.